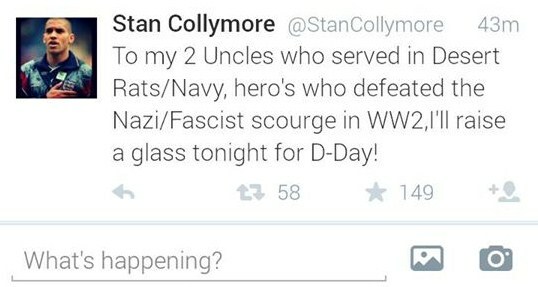 In response to Stan Collymore’s second tweet on the Falklands, Falkland’s veteran and author Ken Lukowiak, has another letter for Stan. Only this time; the news is all bad. It’s me again, Ken. I wrote you before but you didn’t wrote back! So, I tried sending you a tweet but all I got was a message that said: ‘blocked from using this account by the user’. Which I guess means you. I’ve never been blocked before Stan, so I have to ask why? Is it coz I is white? Or is it because I’m a Falkland’s veteran? Either way; I’m not happy! As I said in my last, you did a very stupid thing when you tweeted that insensitive ignorance about the Falkland Islands. I’m hoping that by now even you’ve come to realises that. If not – then I feel sure that your employers at Talksport do. Because they’re in this as deep as you are Stan. Oh, they’ve tried saying that it’s got nothing to do with them. ‘Our Stan’s a law unto himself – so don’t blame us’ that’s been their line. But their logo appeared at the top of your tweet page so, people aren’t seeing it that way. Though me, I’m still at a loss to understand why you ever thought it was an act of genius to write such uninformed rubbish in the first place. I mean, what have you got against the Falkland Islands? I did think that you might have a such a deep self-loathing, that by default, you just automatically hate the thought of a place that has a capital that shares your name. But then I thought ‘Hold your penguins, maybe it’s about something that they haven’t got on the Falklands. Something that Stan feels is a necessity of life’. And then it came to me. Lay-bys! There are no lay-bys on the Falklands. And by lay-by I mean a place with a big ‘P’ for parking sign and a corporation rubbish bin to pop your used condom in after you’ve partaken of ‘the dog’. So no wonder you think it’s just a pile of rocks inhabited by sheep. And Stanley, really, I despair. Where was your head when that one popped into it? Did you really think that the thousands of people that you offended with your first tweet were going to go: ‘Oh, well that’s alright then’. Did you? Honestly? You see Stan, for us who fought there or lost family, or friends, or loved ones there – you didn’t need to mention 1982. You didn’t need to mention the 255 soldiers, sailors and airmen who died there. We did that for ourselves. We can’t help but. ‘We shall remember them’. Remember that? I see by your past tweets that you’ve remembered it often. And in a good way I might add. You’ve recently made mention of two of your uncles who fought in the Second World War. You quite rightly said that they were both heroes. ‘Heroes who defeated the Nazi/Fascist scourge in WW2’. That’s what we did in the Falklands Stan. We defeated a Nazi/Fascist scourge. It’s a fact about the war that often gets lost these days in amongst all the talk of sovereignty. And oil rights. And defence budgets. And sheep. The Argentines certainly don’t like to bring it up. They don’t like to remember that their government, the one that invaded the Falklands, had ‘disappeared’ over 30,000 of their own citizens. They even took hundreds of newly born babies from mothers who were then thrown alive and kicking from helicopters into the sea. You should tweet about that sometime Stan. Ask of that ‘What glory, what triumph’. Maybe even see if you can get the Argentine football team to display that fact on a flag before their next international. A sign that does not mention the Murdered Mothers. So what now? Well, I guess at your end everyone’s hoping, and praying, that given time, it will all just die down and be forgotten. If so, then you need to think again. The people that you’ve offended won’t be going anywhere. In 1982 some of us marched across the Falklands with 380lbs on our backs (well, maybe a bit less) and if we have the determination to do that – then believe me – we can send emails and letters to Talksport sponsors till the arthritis sets in. Not to mention the phone in’s. We’re like kids ticking off the days to the holiday in Disneyland, waiting for your next phone in Stan. Should you doubt me – well – listen to this. There’s a march taking place next month in London. On the 4th of July my good looking self and several hundred other ex-paras, plus a whole load of our people who care, will be marching on Downing street to hand in a petition . We hope to get a posthumous VC awarded to an airborne brother called Stewart McLaughlin, who was killed in action on Mount Longdon during the Falklands war. Which was 32 years ago now. 32 years and still we haven’t given up on Stewart. See what I’m getting at here? How you can put all of this right – I really don’t know. Maybe you don’t want to. I don’t know that either. If you do, then I think the first step is for you to just man up and apologise. Start by just saying that you’re sorry. Because deep down Stan, if you honestly search in your heart, I believe it’s what your two uncles would want you to do. Or am I wrong? Controversial as ever. My good pal Ken Lukowiak puts plainly why football Stan Collymore’s recent comments on the Falklands War haven’t gone down well with those who fought to expel the forces of the Junta. Well written Ken. The campaign must not stop till he is sacked by Talksport. Good drills Ken (Again), missed the conflict as only joined in June 82 myself. Good effort and keep up the good work! Brilliant bit of writing which hopefully sinks in to his head that what he wrote was despicable although I begin to doubt he has any brains at all otherwise he would have already appologised. TalkSport should also be ashamed of the cowardly way they have tried to ignore it all. Hopefully companies who support the military might choose to advertise elsewhere. Well said Ken. You put into the right words what hundreds no thousands are saying. A real man would have said sorry well before now, but as we well know a low life that beats up women can not be classed as a MAN. Keep up the good work we are all behind you no shoulder to shoulder, attack one you attack us all. Why hasn’t Talk Sport sacked him, surely they don’t want to be tarred with the same brush as this so called Human being ?? Keep up the good work. With you all the way !!! Collymore you are a total wanker!!!!! I don’t know the rights and wrongs of this too much but isn’t Stan saying that the way we initially took the Falklands wasn’t right or lawful. If this is the case it isn’t necessarily relevant how tyrannical the government of Argentina who were looking to take it back were. This doesn’t make anybody who fought for their country in that war any less brave nor worthy but nor does it mean that we were right to initially claim the Falklands, does it? Jamie no disrespect meant. However your lack of historical knowledge on the Falklands is apparent. I know the islands are a “long way away”, however as an ex 2 Para veteran let me assure you Margaret Thatcher was correct to send the Task Force and with my now knowledge of the islands and islanders, I would do it again tomorrow. This is exactly where the problem with Collymore arises, making idiotic comments about a subject he knows damn all about. And that Jamie I can assure you has been he biggest error in his career to date. Jamie, The Falklands were never inhabited or ‘owned’ by Argentina, in fact Argentina did not even exist as a country when the British first inhabited them. 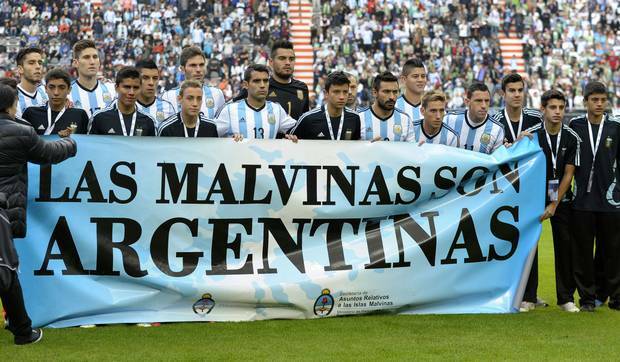 We didn’t ‘thieve’ them from anyone so Argentina were not ‘taking them back’ they never had them in the first place! And the tyranny of Argentina is very relevant, particularly to the Falkland Islanders who would have been treated exactly the same way. They don’t want to be Argentinian, they want to remain British and they have every right to self determination. Stan you are a total , try engaging your grey matter (That’s brain to you Stan, I’ll keep it simple for you) before engaging your big mouth!!!! If you think so little of the Falklands and the Veterans that fought for their freedom then please feel free to move to Argentina.